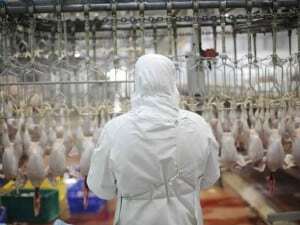 There has been a large increase in the proportion of animals killed through religious slaughter without first being stunned, a survey for the Food Standards Association has found. The number of cattle killed according to the principles of Islamic Halal slaughter without being stunned rose by nearly a third between 2011 and 2013, while the number of sheep not being stunned increased by half. The only progress on animal welfare was with Halal-slaughtered poultry, where slightly more (1.7%) were stunned than previously. The number of animals killed without being first stunned for Jewish Kosher slaughter decreased across the board in the same period, however. The overwhelming majority of animals killed using Halal methods are stunned before killing; around 80%, according to the British Veterinary Association. This proportion appears to be falling, however. Awal Fuseini, certification manager of the Halal Food Authority, which stuns its animals, told The Times newspaper that the increase was due to “stronger campaigning” by some Muslim groups who believed stunning killed animals. He said a trial to show that animals recovered would help convince campaigners that stunning was in accordance with Islamic law. “If we are given the backing to do the trial then we can prove to people that whatever information they have that stunning kills animals is not true,” he told the newspaper. One in 50 cattle killed in Britain is not stunned; roughly one in 30 chickens suffer the same fate. The figure rises to one in seven for sheep and goats. The figures were obtained by visits from FSA officials to a representative sample of 232 slaughterhouses and was conducted in September 2013. Working with the RSPCA, the British Veterinary Association has gathered 100,000 signatures on a petition calling for the end of the practice. David Bowles, RSPCA Head of Public Affairs said there should be no exemption for religious groups. “There is growing public concern about the welfare of farm animals and people believe animals should be treated as humanely as possible throughout their lives, including at the time of slaughter,” he argued. UK HALAL STATISTICS 2013 DATA. According to the 2011 UK Census the Muslim population is 2.7m comprising 4.8% of the population. The Food Standards Agency (FSA) carried out a welfare survey during the week 16-22 September 2013 requesting information which included data on different slaughter methods (www.food.gov.uk/news-updates/news/2015/13501/animal-welfare-survey-of-slaughterhouses-published ). Notably the survey did not collect the extent of mis-stuns for that week even though the question ‘Does the business operator monitor the effectiveness of the stun for each animal’ was in the survey so data collection should have been possible. Alarmingly 13% (29 out of 221) answered ‘No’ to this question. Neither did the survey include a breakdown of the type of permissible stuns used during religious slaughter (as not all stun methods are compatible) nor the number of animals that received a stun after the cut (post-cut stunning). The summarized results from the survey, as it relates to Halal meat production, are as follows. Table 1: Slaughter statistics by Halal methods (FSA, 2013). *Traditional Halal data includes Post-cut stun Halal which was originally reported separately in FSA’s 2011 survey. The survey’s percentages applied to UK meat consumption data provides an overview of the extent of Halal meat in the marketplace (Table 2). The 2013 UK meat consumption data was obtained from the Agriculture and Horticulture Development Board (AHDB) economic division (www.eblex.org.uk/industry-reports/meatstats/ ). ***Traditional Halal data includes Post-cut stun Halal which was originally reported separately in FSA’s 2011 survey. Assuming 16-22 September is a representative week Table 2 establishes that at a UK level 2.5% of the total meat consumed in 2013 was produced by traditional Halal slaughter without stunning, which is significantly less than the 4.8% of the population that is Muslim. In 2011 the corresponding percentage was 2.1%. The FSA data allows comparison of two discrete weeks – w/c 16th Sept 2013 and w/c 19th Sept 2011. There is no attempt to average inter-week variation. Unless I’ve got it wrong the total halal kills were less in 2013 than 2011 – like the smaller kosher kills. I’d say that from week to week there is considerable variation. The trend for non-stun meat may be rising but we cannot say that based on the FSA data. There is another flaw in this report. It seems that the FSA has decided to perform this survey in the corresponding week each year it does this. That surely enables business operators to warn staffs to be on their best behaviours. Clearly there are observational issues because covert inspection of stun and slaughter areas is seemingly preferred. One would have thought something more random would be more suitable. The bulk of the information is about procedure and that won’t vary much from day to day let alone week to week. Slaughter numbers can be collected by other means, surely. And they need to be collected more often if trends are to be identified.